December 27, 2014 December 25, 2014 LauraLeave a Comment on Crafty: Last gasp of Christmas. Crafty: Last gasp of Christmas. I didn’t grow up celebrating Christmas, which might explain my enthusiasm for it as an adult. This year I was excited to pull out the tree and the ornaments and make the house festive. As I unpacked the ornaments and stockings, my husband remarked that we didn’t own a tree skirt. I’ve only put a tree up for a couple of years and hadn’t quite gotten around to a tree skirt. But then I started to think about it, and my husband suggested I knit one and a crazy project was born. 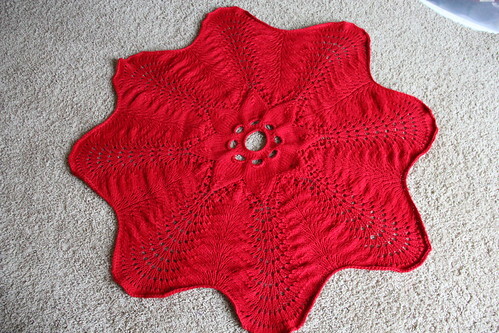 I chose to knit the Hemlock Ring Blanket which is adapted by Jared Flood from a doily pattern. 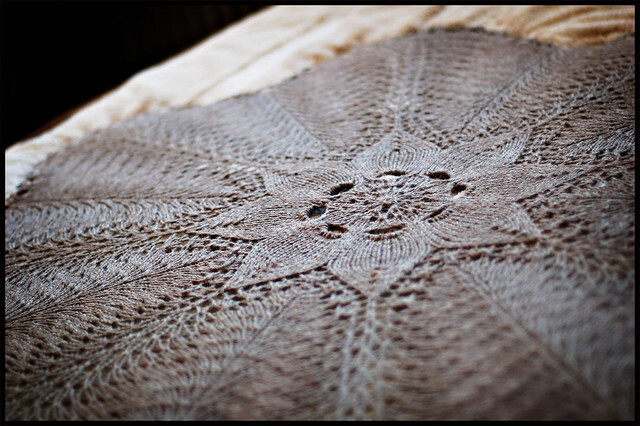 He suggests using a rustic bulky wool to upsize the doily into an heirloom blanket. 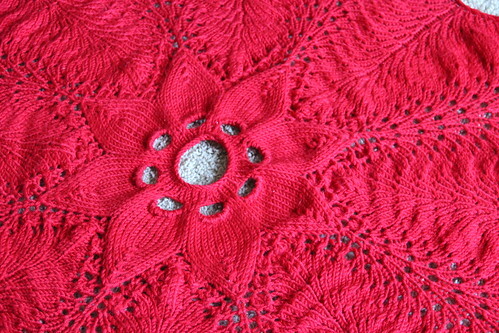 The blanket is knit in the round so I immediately had to decide whether I would knit the project back and forth, and create an open seam; knit it as a whole piece and steek it; or just leave a hole in the center. I opted for the last option. I also had to decide what yarn to use, particularly since I didn’t have anything in my craft room that would work. I ultimately went with Lion Brand Lion’s Pride Woolspun, which I’m not sure was the right choice. While I liked the price point and easy care, I think I should have chosen a yarn that was wool (rather than an acrylic/wool blend) for ease of blocking. When it came down to blocking, I decided to do what’s known as “killing” the acrylic, basically steam blocking it which is irreversible in acrylic yarns. Anyway, regardless of how I might improve upon this project if I were to tackle it again one day, I am pleased with my efforts. I knit the entire project in less than 2 weeks and created something I’m sure we’ll use for years to come.